Don’t be surprised if Annie Appleby stops you in the grocery store to point out a concerning mole. She’s not trying to be nosy, she just wants to help you protect your health. In fact, such an encounter may have saved her life. She was jogging in her native California when a man on her path stopped her and pointed out a spot on her back. He explained that he was a dermatologist and said she should have it checked out. It turned out to be a very serious case of melanoma. Luckily, it was caught before it spread. “That experience really re-enforced for me how important it is for us to look out for each other and to raise awareness about the need to take care of our health and how we can do that,” she said. Annie has built her second career making it easier for people to stay healthy. Her first career was as an executive in the legal department of Paramount Pictures making sure the studio didn’t get sued over a misspelled name or wrong-sized picture. She turned to yoga on the Paramount Lot to relieve the stress. Practicing yoga turned into teaching yoga, which led to designing clothes for yoga. 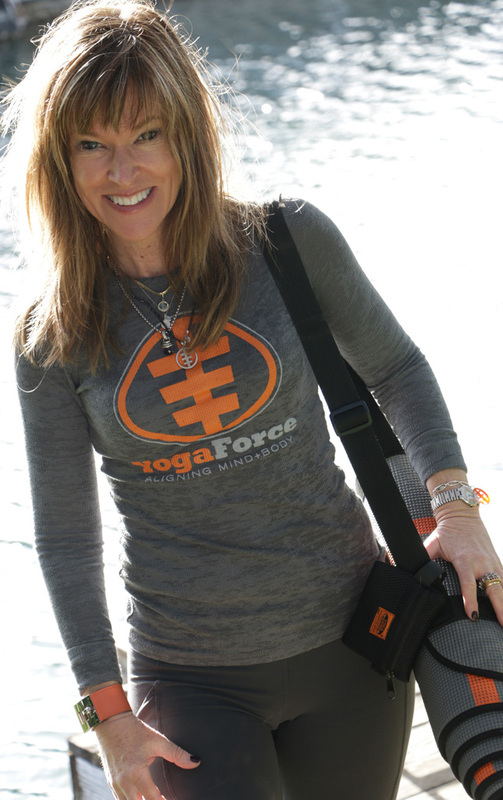 In the mid- 1990s, Annie left the legal work to build her own company, YogaForce, which initially was all about selling those clothes. Sales grew quickly as Yoga grew in popularity and her line made it into several big name stores and on to several popular TV shows and Motion Pictures. Eventually it got to be bigger than she wanted and around 2005, Anne stopped selling clothes for a while to concentrate on building a better mat for yoga and Pilates. Anne didn’t really think about a need for a change until after she was injured in a car accident. Her instructor pointed out that she was out of alignment. She tried using masking tape to make guidelines on her mat, but it wouldn’t stick. The patented mat she designed has a center line and three horizontal stripes to help users orient and align their bodies. The YogaForce A-Line Mat features an ergonomic shape that makes it fit better in a crowded room. The carry straps are sewn in so they don’t get misplaced. “I based it on what I needed, but it really is something that can help anyone optimize and improve their movements,” she said. Ella Health uses YogaForce mats for our women’s physical therapy programs and Pilates classes. Annie credits the mat for helping her get into the best shape of her life and making it possible for her to run marathons after several orthopedic surgeons said she’d never run again. YogaForce recently started selling other items along with the mats. And, Anne continues to find ways to help women as an official SPOTLighter for the American Academy of Dermatology and a certified spokesperson for American Bone Health. The biggest health challenge for women is simple, Anne said. They’re not teenagers anymore. They don’t have the balance that they used to have. The mat leads to better body awareness and alignment, contributing to improved posture, strength, balance, mobility, bone health and a lean appearance and reduced risk of injury. The mat emphasizes simplicity, functionality and wellness. Give it a try at www.yogaforce.com. With American Bone Health, Annie is working on a series of wellness presentations at Ella Health in San Francisco including Bone Health 101 on March 3; Safe Exercise on April 14; and Nutrition on May 5. Contact escanlon@ellahealth for more information.